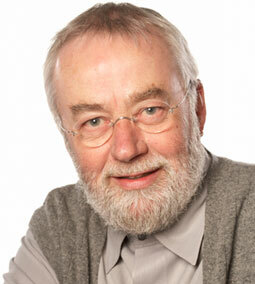 William (Bill) Moggridge (b. 1943), a British industrial and interaction designer, the current director of the Smithsonian Institution's Cooper-Hewitt, National Design Museum in New York, is known as a pioneer of interaction design and one of the first people to integrate human factors into the design of software and hardware, as well as the designer of GRiD Compass 1100, the first commercial laptop computer. Moggridge designed the computer in 1979, but the first GRiD Compass (the computer was announced in marketing materials as Model 1100, but it did not exist, the released machine was the Model 1101) was released in April 1982, at a price 8150 USD. The manufacturer was GRiD Systems Corporation, Mountain View, California. Along with the Sharp PC-5000 and Gavilan SC computers, released in 1983, the GRiD Compass established much of the basic design of subsequent laptop computers, although the laptop concept itself owed much to the Dynabook project of Alan Kay. The design of GRiD Compass (see the lower image) used a clamshell-style die-cast case (where the screen folds flat to the rest of the computer when closed), which was made from a magnesium-alloy (GRiD had the patent on the clamshell idea). The size of the machine was 38 (H) × 29 (D) × 5 (H) cm. 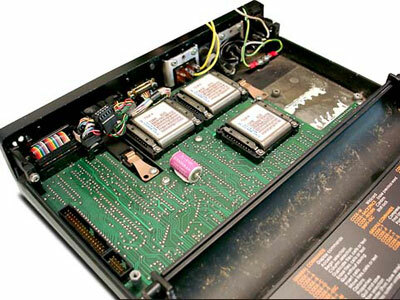 The computer featured an Intel 8086 processor (8MHz) with 8087 math coprocessor, 256KB DRAM (up to 512KB), a 6-inch 320×240-pixel bright (80 chars × 25 lines text), sharp electroluminescent monochrome display, 384K internal magnetic bubble memory (it is a type of non-volatile computer memory, developed by Andrew Bobeck in 1960s, that uses a thin film of a magnetic material to hold small magnetized areas, known as bubbles or domains, each storing one bit of data), and a 300/1200 baud modem. I/O ports are RS-232/422 serial and GPIB parallel (Grid Processor Interface Bus), which allowed daisychaining of multiple computers? The keyboard was full stroke 57 keys. External devices such as hard drives and floppy drives (10 Meg hard drive/5.25-inch floppy drive combo or 360K 5.25-inch floppy drive model) could be connected via the IEEE-488 I/O. The power input is ~110/220 V, 47–66 Hz, 75 W.
The GRiD Compass ran its own operating system, GRiD-OS, which was a full-function, menu-oriented and powerful operating system. The suite included also several applications: GRiDManager (communication and utility functions), GRiDPrint (control format and appearance of text files), GRiDPlan (electronic worksheets), GRiDFile (database utilities), GRiDPlot (converts data to graphs), GRiDBASIC (high-level programming language), and GRiDWrite (full-screen text editor). GRiD Compass 1101 with opened case (source: oldcomputers.net). The three bubble memory modules are seen on upper-right corner of the motherboard. Originally developed for business executives (who else can afford a personal computer for 8–10000 USD at that time? ), GRiD Compasses were also used by the U.S. government, U.S. military in the field (naval vessels, attached to paratroopers, etc. 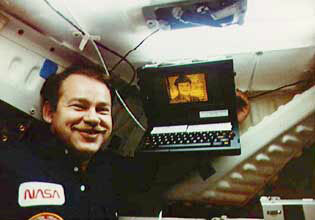 ), and by NASA on the Space Shuttles during the 1980's. It's even believed that the US President's nuclear football at one time included a GRiD computer. 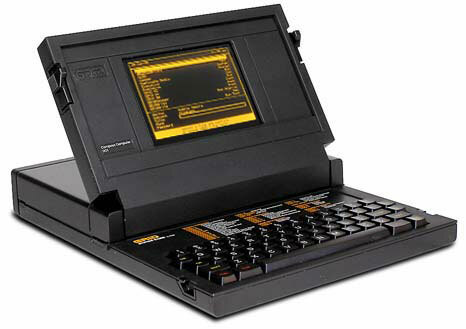 The portable Osborne 1 computer sold at around the same time as the Compass (in the beginning of 1980s), although lacked the Compass's refinement and portable size, was more cheap and more popular device, moreover it ran the popular CP/M operating system.